WANTON, John (1672-1740) Colonial governor of Rhode Island, 1734–1740. 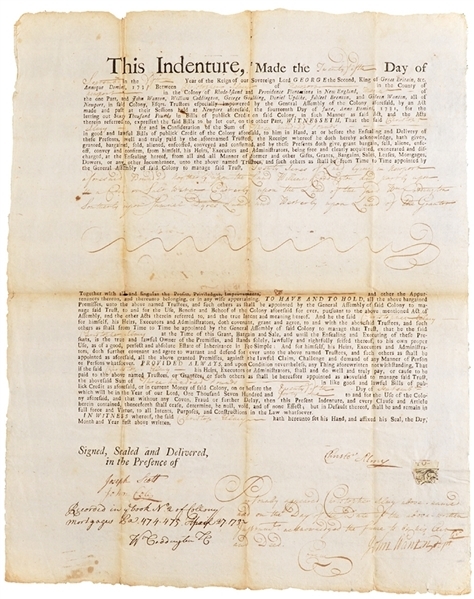 Document Signed, “John Wanton”, partially printed indenture, 1pp, 13" x 16". Rhode Island Colony. September 22, 1731. The document serves as an indenture in the sum of One hundred and fifty Pounds for " … A dwelling House and piece of land lying Newport aforesaid containing about eighty feet in Front and about fifty feet in rear and is bounded Northerly on aa High Way Easterly upon John Brown's Land Southerly upon High Way and Westerly upon John Chapman's Land …" Usual folds. Some splits and paper loss at center fold. Some discoloration. Overall Very Good.